Maybe you do not know what to buy when your wedding anniversary is coming. Romance is also an important factor, whether this is a surprise gift, a date night or simply somequality time together. If you already decided to present a meaningful gift, you can send us photos of your love and yourself, then you will be getting your matching wedding bobbleheads in some weeks. However, you can surprise your spouse with matching wedding bobbleheads. It would be an original and creative gift, something to immortalize the perfect picture of your wedding day. Whether life is happy or sad, when you and your spouse see the wedding bobbleheads, your life will be full of fun, since it is the symbol of witness your marriage. 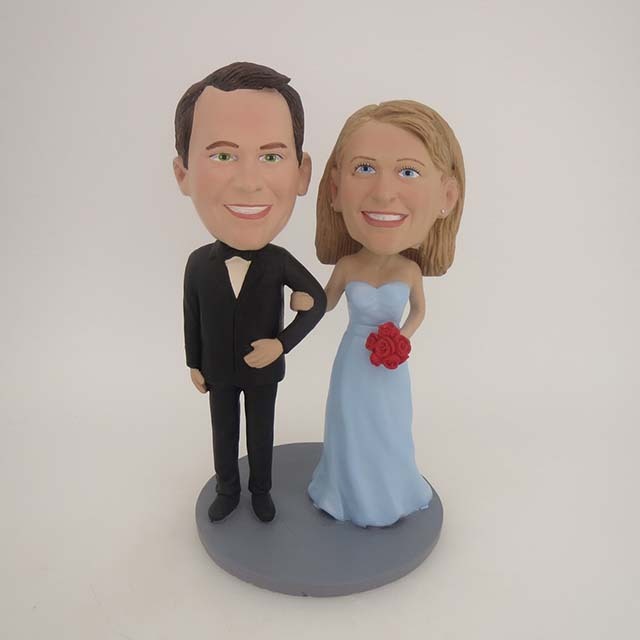 The bobblehead bride and groom will look adorable, and you can remember your wedding day every time you look at that handsome funny couple in your living room or on your office desk. Your wedding day is a day to remember, something that happens once in a lifetime. Why wouldn’t you immortalize it by charming wedding bobbleheads? It can be the best reminder of the most beautiful day of your life when a new day rising with your spouse. So, what are you waiting for? What are you hesitating? Please get your the fantasy wedding bobbleheads gift, keep the lovely funny couple as a keepsake of the most beautiful moment of your entire life. If marriage is a refrigerator that can keep love fresh and make both lovers stay at the happiest moment, then wedding bobbleheads is the best ornament.